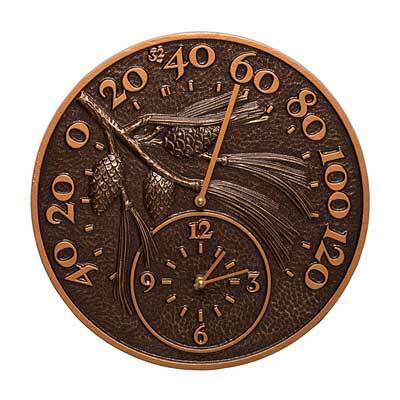 Add a natural look to your timekeeping with the Whitehall Pinecone Clock and Thermometer. A pine branch, complete with three-dimensional needles and cones, graces the front of this combination. Texture on the branch, pinecones, and needles adds interest to the unit, and brings a realistic feel to the piece. Large, copper colored numbers create an exterior ring on the item to tell the temperature, from -50° to 130° Fahrenheit. A copper colored needle will point to the current temperature, which can be determined at a quick glance. A smaller, interior circle houses the clock, which uses one included AA battery for power. A hammered finish creates the background of the unit, lending additional texture to the piece, and the antique copper colored finish creates a natural look. The sturdy, recycled aluminum construction will withstand harsh temperatures for several seasons, and may be placed indoors or out. Hang this combination on a wall with the attached hanging ring, for perfect placement. Enjoy monitoring the temperature and time using this Pinecone Clock and Thermometer. Made in the USA.